Pi-hole timeout when tries to show the block page for blocked domains. The block page (/var/www/html/pihole/index.php) internally calls a php script on the same server using an http request, but php5-fpm is configured with only 1 server and 1 child process ( /etc/php5/fpm/pool.d/www.conf ) , so the call timeout because can't fork any more process to reply that self request. Pi-hole must show the block page instead of a timeout message. The request from http://pi.hole/pihole/index.php to http://127.0.0.1/admin/scripts/pi-hole/php/queryads.php?domain=$serverName&bp fails. In my case, just open a blocked domain. Many thanks for the report 👍 i'll need to investigate. Are you running your VM as single core/CPU? Yes, it’s a single core hyper-v vm. Mapping 1 core to max 1 one php-fpm process could do the job in some scenarios, but I think limiting it to 1 thread per fpm process is not enough. Do you use a Custom Block Page ? Like https://github.com/WaLLy3K/Pi-hole-Block-Page ? If you would like to implement a custom block page, it is since Pi-hole v3.2 recommended to create a file called /var/www/html/pihole/custom.php and use that instead. I think, you just want to simple click in Dashboard on a Blocked Domain and get this? I didn't have time yet to replicate the issue on a clean install, but I only did normal dietpi and pihole update proceses. Yep, please can you try increasing the child count to say 10? On an average each PHP-FPM process took ~75MB of RAM on my machine. I've increased the pm.max_children = $(( $CPU_CORES_TOTAL * 3 )) for v160. This should resolve issues, however, if you have a chance to test and verify (#1298 (comment)), i'd appreciate it. 1.- Installed the VirtualBox DietPi image. -Got the same config I have in php5-fpm. -Got the usual blocking page. 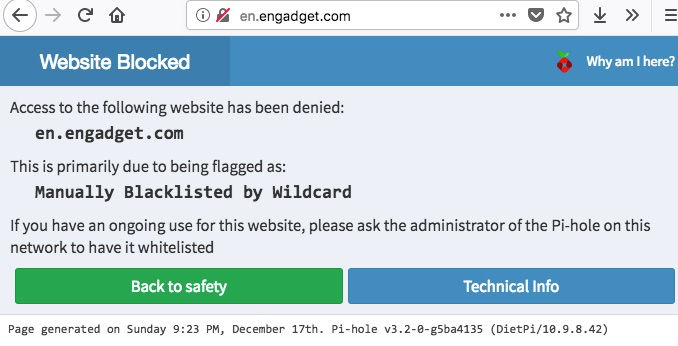 pihole already up to date. 7.- Now started to wondering why I got another blocking page, not the text one above I got when first installed pihole months ago, because the only thing I did was install the pihole and dietpi updates. When pihole is installed the first time using dietpi it uses a different /etc/lighttpd/lighttpd.conf than the one installed after a pihole -up upgrade. Network-wide ad blocking via your own hardware. This file is copyright under the latest version of the EUPL. Please see LICENSE file for your rights under this license. FILE AUTOMATICALLY OVERWRITTEN BY PI-HOLE INSTALL/UPDATE PROCEDURE. include_shell "find /etc/lighttpd/conf-enabled -name '*.conf' -a ! -name 'letsencrypt.conf' -printf 'include "%p"\n' 2>/dev/null"
Now got some progress, that was the error message I was looking for. changed pm.max_children from 1 to 2. 12.- @Fourdee , Answering your question, for me, works with at least 2 max_children. Thanks. hmm.. will we get the new block page feature? What will be with the other web server stack? Will this work with the symbolic links as well? When we added the above, Pi-Hole didnt have a block page at that time (if i remember correctly). Edit looks like the main Pi-Hole index page handles the block page aswell? Needs more research to see if this can be implemented compatible with our global webserver confs, and, if it has no effect on other web applications (eg: nextcloud). I'll mark this as closed, original issue is resolved in v160. - ARMbian based images are now mainline kernel 4.13+. - If you are happy with your existing installation of v159 (or lower), you are not required to install the v6.0 image, however, we cannot continue to provide support for v159 (or lower) installations. General | We have completed much needed backbone work for DietPi, which will allow for improved expansion in source code. This includes the use of dietpi-globals. General | SparkySBC: CPU gov default changed to Performance, reports of increased stability. DietPi-Automation | All dietpi.txt entries have been renamed and cleaned up. DietPi-Config | Dion Audio LOCO V1/V2: Soundcards added for RPi. DietPi-Config | Locale: en_GB.UTF-8 is now automatically installed, alongside user selected choice. Required for DietPi scripts to function. DietPi-Software | ownCloud: Switch to non-package/archive installation. This allows usage of preferred web based updater. DietPi-Software | Plex Media Server: Resolved uninstall to include /var/lib/plexmediaserver in removal (which is not completed via apt purge).